Ready to be placed in the bowls! Last Friday afternoon my Slow Cooker was doing the cooking for me! Dinner needed to be hearty, delicious & also have another 2 servings for another quick dinner during the weekend. I've been working on Long Meddowe Days for the past few months and the 35th celebration took place this past weekend. Long Meddowe Days is my town's (Longmeadow, MA) celebration in May of our long colonial history. Our celebration includes a craft/ artist fair, 5K road race/ walk, history tours, food & entertainment. Yes, I've been cooking, but with all of our other wonderful family celebrations I have not been blogging. Friday at dinner time it was time to locate the soup bowls & the fat free sour cream. 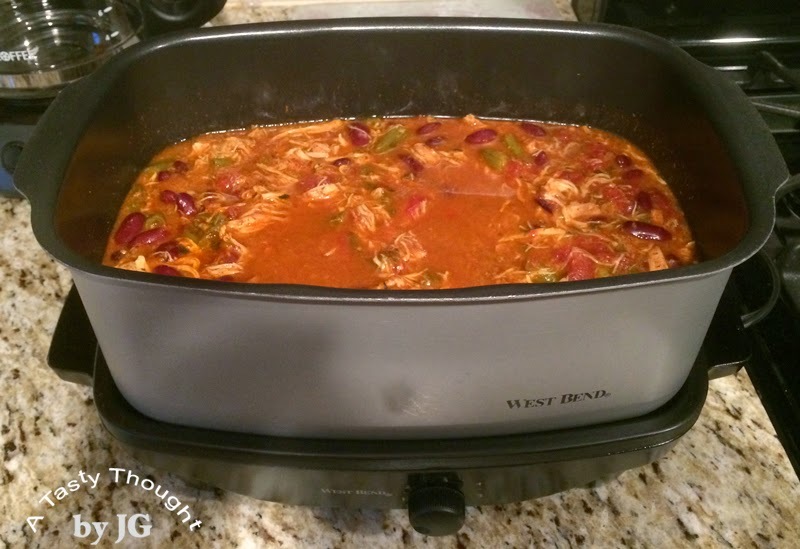 When the chicken was purchased earlier that day I knew that Chicken Chili would be bubbling in my slow cooker. We needed a green veggie. There were no peppers in my freezer nor in my fridge, so I added a package of defrosted Green Beans to my recipe. How yummy & spicy! It took little time to place the ingredients in my Slow Cooker's pot. We do eat many dinners containing chicken and this chicken recipe is so tasty any time during the year! Optional: (1) 8 oz. can Tomato Sauce is added. Spray PAM on bottom of Slow Cooker pot. Place defrosted Green Beans in Slow Cooker Pot. This Slow Cooker meal was a very hearty dinner after a busy day! There were leftover portions, also! Quite often they are placed in my freezer, but last weekend we devoured them at another dinner! The sun was shining & the weather was warm, so we had a very successful Long Meddowe Days! Woohoo! ***Note: When reheating, about 6 ounces of water may need to be added to the Chili. Fenway! A Frank with mustard! The Fam! Jon Lester striking out 15 players - his career high! The Red Sox winning the game last Saturday over the A's! A very sweet day!!! 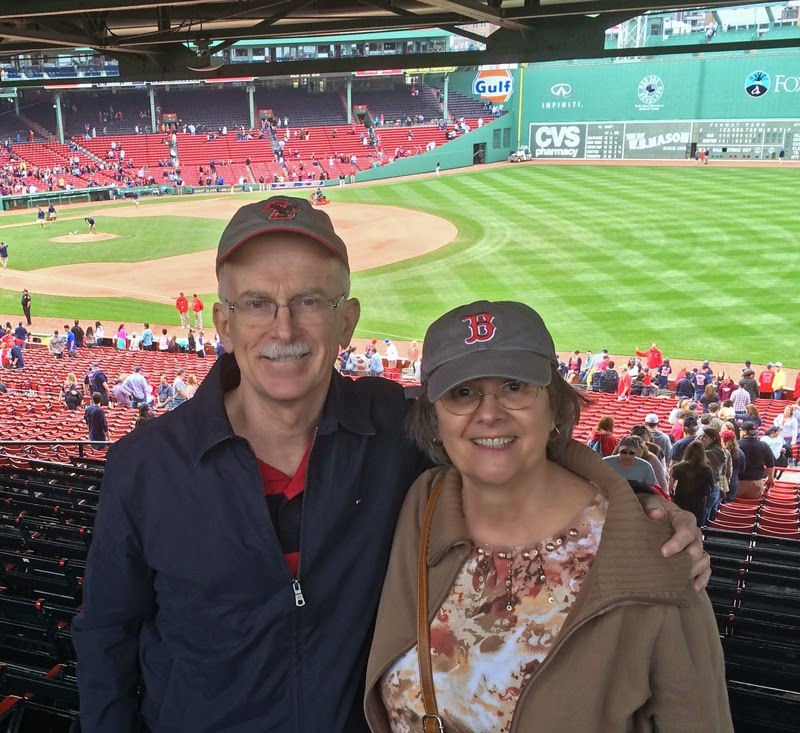 It's always great to go to Fenway Park in Boston for a Red Sox game. A road trip east on the Mass Pike and then the T ride from Riverside Station into Boston. I know that I celebrated Mother's Day a week early! Our 2 sons, our 2 daughters (in- law) & 2 grandsons enjoyed chatting it up and munching during the game! Is there any better food to enjoy at a ball park than Franks & pretzels during the game?? ?